Critical Hit Magazine Issue #2. 48 pages (including 15 scenarios). 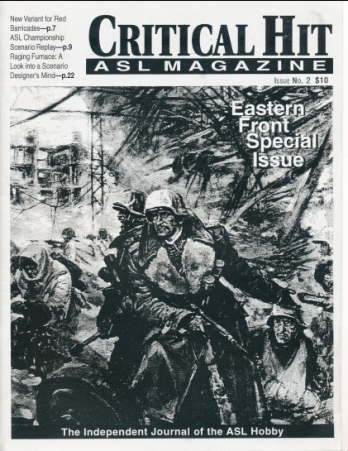 The second issue of Critical Hit Magazine, billed as an “Eastern Front Special Issue,” is meatier than the first, increasing both the number of pages and scenarios by a third. Worthy articles include a Scenario Replay (of CH13, Moyland Bloody Moyland) by top-rank ASL players Ray Tapio and Steve Pleva, an article with tips for beginners by Russ Gifford, and an article on Red Barricades tactics by Tim Robinson and Tom Ruta. Some copies may have come with cave and landing craft play aids or an ASL Index.